There are plenty of statistical sites on the web. HawkBlogger.com is largely a journal of everything going on with the Seahawks over time. There are times that statistics help to tell that story, and that is why I created this Season Progress Report series a couple years back. 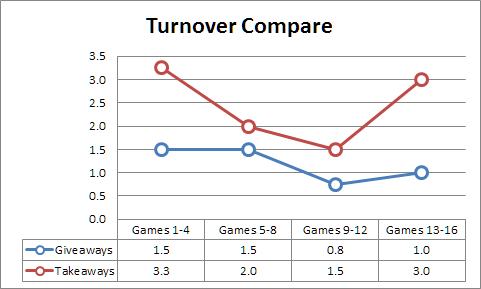 A gap in the statistics out there is the ability to freeze points in time, and allow you to rewind and compare how the team has progressed or regressed as the year rolls on. Player splits (e.g., first half of the year vs second half of the year) are common, but team splits are less so, and quarter-season splits can only be found here, from what I know. I track every Seahawks game, and have for years. That allows me to break down trends over any period of time I choose. As this season continues, I will provide a progress report at each quarter point of the year, and highlight other trends I see in-between. An offense that exploded in games 9-12, came back to Earth in the final four games of the season. The Seahawks had stepped forward in each aspect of offense that I measure in the last progress report, and have dropped in nearly all of them this time around. 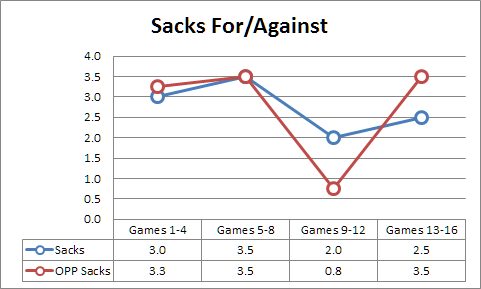 It is no coincidence that 3rd Down % dropped the same time as opponent sacks went up. The opposite was true in games 9-12. It is not as simple as the pass protection is breaking down, so the third downs are not being converted. 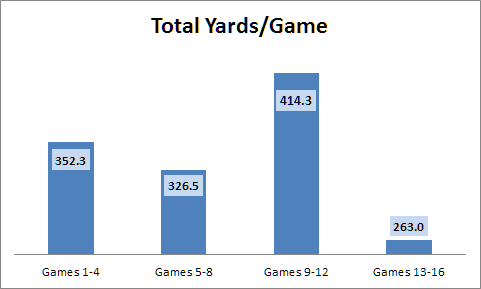 It has been a struggle to gain yardage on early downs, leading to longer third down situations. 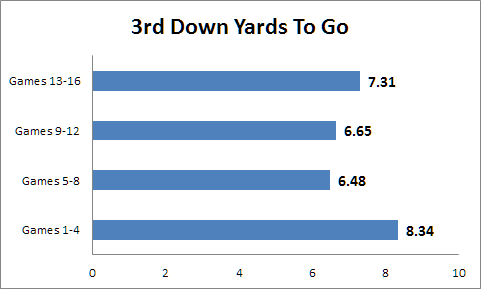 It is remarkable how well the Seahawks did on third down in the first quarter of the season given the long yardage they faced. 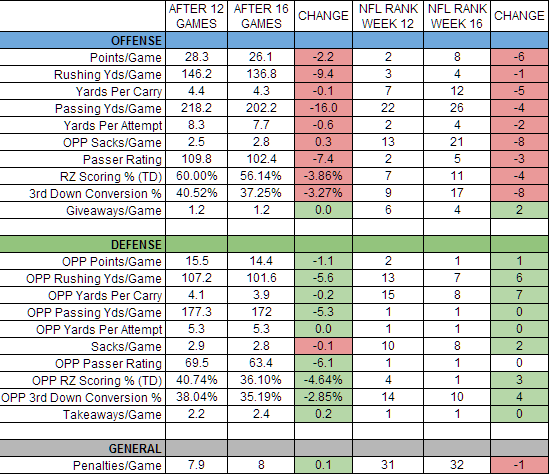 That stretch included possibly their most amazing third down performance of the season when the Seahawks converted 46% of their third down tries that averaged 9.69 yard to go against a fantastic Carolina defense on the road. That was terrific, but not sustainable. 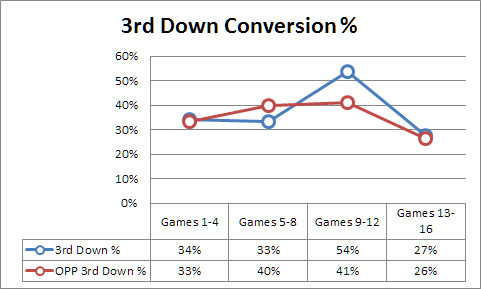 Seattle needs to regain their form on early downs to make third down a more attainable conversion as they head into the post-season. It is worth noting that while we dislike seeing the downward trend in the offense over four games, the trend becomes much less legible when the season is divided in two. The team averaged 25.6 ppg in the first eight games of the year and 26.5 in the last eight. 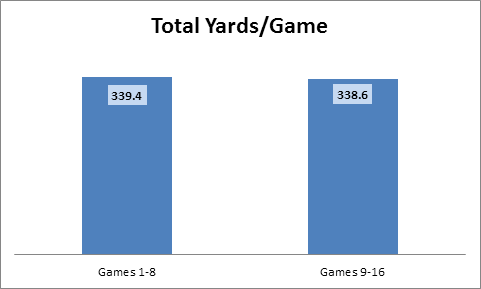 They averaged 339.4 yards per game in the first eight, and 338.6 in the last eight. 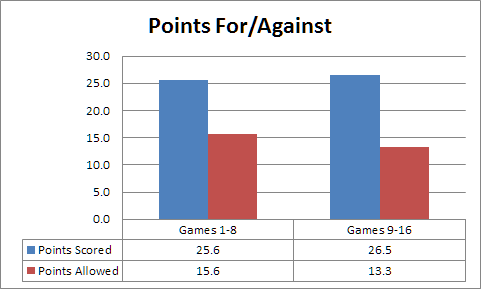 Those numbers suggest that the offense has not really grown or regressed much over the course of the season. They had ups and downs, but the overall body of work is pretty darn consistent. 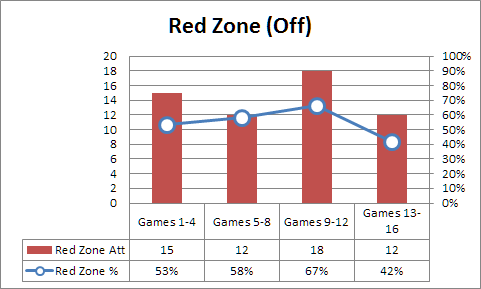 One thing they cannot afford to continue is the drop in red zone play. Scoring a touchdown on less than half their red zone possessions will not cut it. The play-calling has been suspect there, and Russell Wilson’s accuracy has been below his standards. The defense has been making a progress all year. 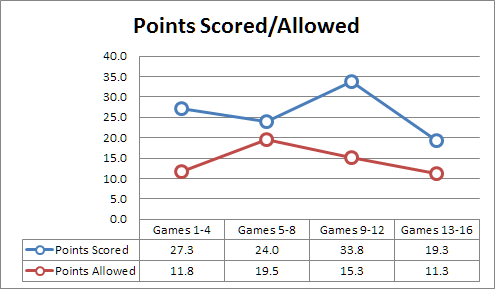 They have lowered their points allowed per game in each of the last three quarters of the year. 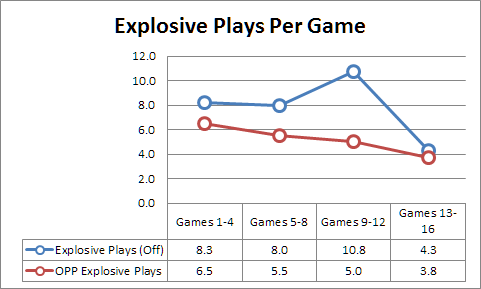 Opponent explosive plays have gone down every quarter of the season. 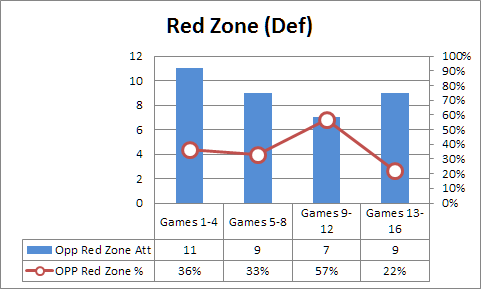 And red zone defense has been outstanding of late, allowing just 22% of possessions to result in a touchdown. This is downright stingy stuff. One word of caution is the big uptick in takeaways the last four games. Takeaways are unpredictable, and while they can be influenced by a defense, it is not something they can control. A fair number of those takeaways came in the opponent end zone. Assuming that will continue is playing with fire. Seattle can be most proud of the progress in the run defense over the last four games. They could have jumped even higher if the Frank Gore 51-yard run was not in there (in addition to all the subsequent runs on that drive). Even with that bust, the defensive line and linebackers have been playing their best ball of the season against the run. 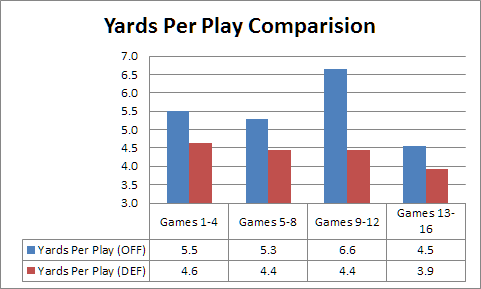 Bad news for Seattle’s opponent is that run defense benefits more from rest than any other group. Fresh interior lineman are priceless. It is no accident that the Seahawks run defense took a step forward after the bye week. This Seahawks team is not sprinting into the playoffs the way the 2012 team did, but there is a stability and seasoning to this group that separates them from their predecessor. The defense is spending less time trying to prove something to the outside world, and more time competing with history to see just how great they can be. Their attention to detail and focus on the task at hand is at a championship level. The offense has never quite found it’s footing with the ever-changing cast on the offensive line. There were signs of real progress in the final game against the Rams. There is not a player on offense that cannot step up their level of play. The NFC playoff bracket is littered with dominant defenses. Having faced San Francisco, New York, Arizona and St. Louis in the last four games could prove to be the perfect practice gauntlet for the post-season.